A Texas police department has removed a biblical reference from its uniform patch soon after the Freedom From Religion Foundation complained. 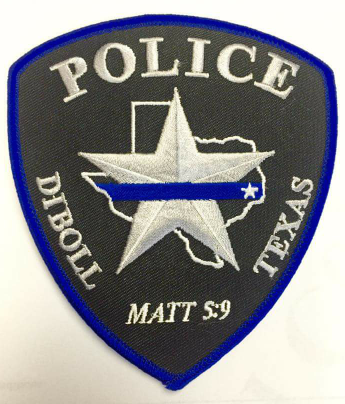 The Diboll Police patches had sewn on them "Matt[hew] 5:9," which reads, "Blessed are the peacemakers, for they shall be called the children of God." "In a phone call Monday morning, Diboll City Attorney Jimmy Cassels confirmed that the patches did not follow the Supreme Court's opinion on the matter of separation between church and state," local television station KTRE recently reported. "On April 12, Cassels received a letter from the Freedom From Religion Foundation. The letter stated several Texas residents had filed complaints with the organization about the patches." FFRF Staff Attorney Sam Grover had emphasized in the letter how the biblical allusion contravened the law. "A biblical quote on city of Diboll property, including police uniforms, violates the Establishment Clause of the First Amendment," Grover wrote in his letter to Cassels. "Including a biblical reference on law enforcement uniforms endorses religion over nonreligion and Christianity over all other faiths." Cassels grudgingly agreed with FFRF. "Whatever your logo or emblem or saying is, it can neither advance nor inhibit religion," Cassels told KTRE. "Personally I may not agree with it but the Supreme Court dictates the laws we have to live by." Ironically, the city is now instead emblazoning "In God We Trust" on the police patches. FFRF Co-President Annie Laurie Gaylor is happy that Diboll is removing the biblical reference, but is concerned about the substitution. "We're glad that Cassels saw reason, even if reluctantly so," she says. "However, there's no reason to still display a religious slogan, especially a Johnny-come-lately, divisive quote that excludes nonbelievers." The Freedom From Religion Foundation is dedicated to the separation of state and church, with 23,700 nonreligious members nationwide, including almost 1,000 in Texas.